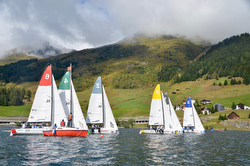 (St Moritz, Switzerland)- Thirty-two of the world’s best sailing clubs representing twelve nations are set to fight for the prestigious silver trophy in the SAILING Champions League Final 2018, due to take place in St Moritz from August 30th to September 2nd. Whoever ends up earning the title of “Best Sailing Club of the Year” will quite literally feel on top of the world, as the winning crew will be celebrating on top of a podium that stands 1,856 metres above sea level, on the shores of Lake St Moritz. The host club of Sailing Club St Moritz has been working closely with the city of St Moritz and the region Graubünden to make sure that this gathering of international talent is given a world-class reception in this beautiful corner of Switzerland, high up in the Alps. The 32 clubs that have made it to the Final qualified through highly competitive Semifinals, the first held in the warm winds of Porto Cervo back in June, the second in St Petersburg when the Russian city put on some very strong and challenging winds. Quite what conditions will meet the competitors in St Moritz is anybody’s guess; it could be cold and light airs like last year’s event, or St Moritz could show its other side with warm, strong breezes as the predominant theme. 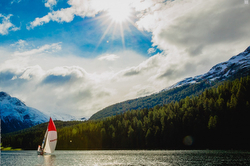 Whatever St Moritz sends their way, the best sailors are those that are most adaptable to changing conditions in 15 flights of eight identically-prepared one-design sportboats. This year’s Final will be the first time for running a four-boat Final Series which was successfully trialed a month ago in Travemünde at the inaugural Youth SAILING Champions League. The top four boats from the Qualifying stage go through to the Final Series, carrying forward their ranking from Qualifying as a single race score. So, the winner of Qualifying would carry through a race win, the runner-up would carry through two points, and so on. In the Final Series, the teams will race against each other until one team has won two races. If the winner of Qualifying wins the first race of the Final Series, they become the outright winner of the SAILING Champions League 2018. On the other hand, the maximum number of races that could take place is four, if the race wins have been evenly distributed across all four teams. Based on the outcome of the first two events, the following clubs should be near the top of the leaderboard; Circolo della Vela Bari (Italy), YC Bregenz (Austria), Club de Voile Saint Aubin Elbeuf (France), Regattaclub Bodensee (Switzerland), Segel-und Motorboat Club Uberlingen (Germany), YC Monaco (Monaco), Norddeutscher Regatta Verein (Germany), Deutscher Touring YC (Germany), three from Russia (Navigator Sailing/ Lord of the Sail- Europe/ Lord of the Sail Asia), and Societe Nautique de Geneve (Switzerland). The SAILING Champions League is proud to be supported by a number of key partners: Juvia, KRAFTWERK, DEDON, Breitling, Badrutt’s Palace, DKSH, SAP and Marinepool. Pink Boat Regattas Raise 1/2 Million Dollars! Gorgeous Sun-kissed Big Boat Series! San Diego J/Fest is Back! Gorgeous J/122E @ Southampton Boat Show! Babe Ruth, Cal Ripken Jr., and Terry Hutchinson? Inaugural J/80 Asian Championship Announcement! Newport Boat Show- See the J/112E, J/121 & J/70! Welles Crowned 40th J/24 World Champion! Women Lovin' Sailin' J/24s! A Love Story! Breault Takes 3rd US Women’s Match Race Title!